Before you can have a discussion about what parts make up a roof, you will need to know a few terms. These terms identify the various architectural aspects of a typical pitched residential roof. 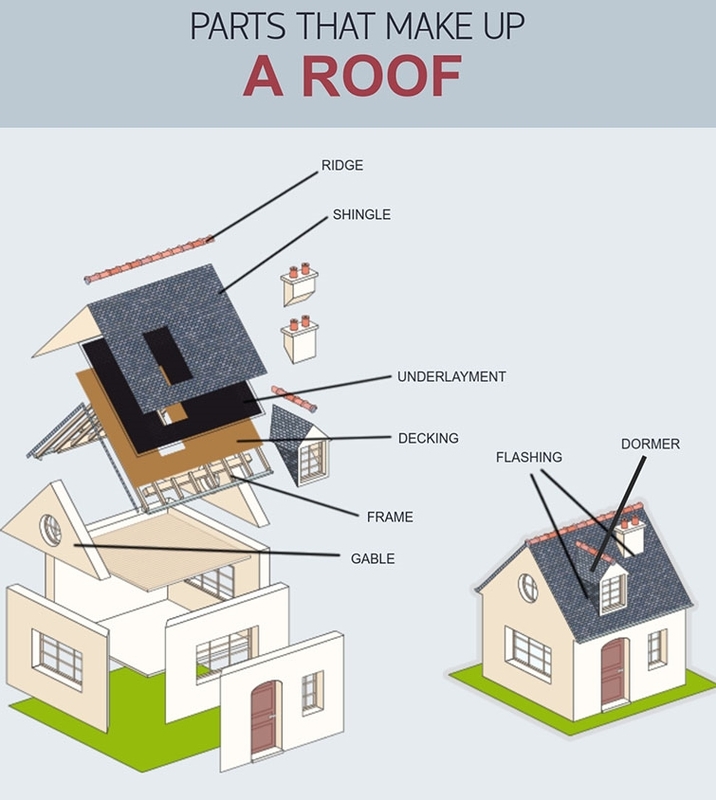 Becoming familiar with these terms will enable you to understand a discussion of how roofs are constructed. The first term is the roof plane. If you recall from geometry class, a plan is a flat surface. In roofing terms, the roof plane is the pitched face of the roof. To describe the places where roof planes meet we use the terms ridge, hip, and valley. The ridge of the roof is the highest point on the roof where two pitched planes meet. A hip is a place where to planes meet and project outward. A hip is similar to a peak, but is not at the top of your roof and is usually not horizontal. A valley, just like it’s geographic namesake, is a place where to planes meet and project inward. A dormer is a common feature on many two-story houses. It is a projection from the main plane of the roof that usually houses a window. The dormer is usually constructed to add space or natural light to the room inside. The gable is not exactly part of the roof, but still an important term to recognize. It is the triangular part of the exterior wall that spans the area between the pitched roof planes. Just like the rest of the house, the roof starts out as a frame. The frame is usually constructed of lumber. It incorporates joists, trusses, and rafters. Together, these three types of beams make up a framework that gives the roof its shape. The frame needs to be strong enough to support the weight of the roof. With a standard asphalt shingle roof, this is not much of a concern. But if you plan to use heavier materials like tile or slate, you may need to add extra supports at this stage. Once the frame is in place, it is covered in decking. Decking is the skin that covers the frame and creates the base that the rest of the roof will be built upon. The most common material for decking was once plywood. However, in recent decades oriented strand board (OSB) has taken over as the most common material for load-bearing planks in residential construction. OSB is similar to particle board, but instead of tiny bits of wood, it is made up of thin strips of wood. The strips are held together with resin and a small amount of wax to form a very strong plank. The first barrier layer of the roof is the underlayment. Underlayment is installed directly on top of the decking. It serves a few functions. First, it forms a barrier between the decking and the shingles that absorbs any resin that might be released by the decking. Second, it serves as an additional water barrier in case any water makes it past the shingles. A lesser-known function of underlayment is its ability to prevent picture framing. Picture framing is the result of the expansion and contraction of the panels that make up the decking. Without the underlayment, the slight movement of the decking could create bumps that would disturb the flat surface of the roof and could prevent proper water resistance. Many modern underlayment materials also have an additional fire retardant effect, reducing the speed at which a house fire could spread. Traditional underlayment is made of felt that is saturated with tar. This kind of underlayment is still widely used today. However, recent innovations have introduced synthetic underlayment with special properties. These may include added water resistance and reduced heat absorption. In some cold climates, roofers may install a special underlayment that acts as a water and ice barrier. It can help protect from ice dams that form when the bottom layer of accumulated snow melts and refreezes at the edge of the roof. Some of these underlayments may have special properties such as being self-adhering and closing around nails for a watertight seal. In cold climates and areas prone to driving rain and high winds from hurricanes, the water and ice barrier might cover the whole roof. In more mild climates, ice and water barriers may still be used in vulnerable areas of the roof, like valleys, roof edges, and around penetrations in the roof. We have covered flashing in detail in some earlier posts, but it is still important to mention here. After the underlayment is installed, flashing is installed in areas of the roof that collect a lot of water. Valleys, where water from multiple roof planes is directed into a gushing stream, are always covered with flashing. The flashing is generally a thin layer of sheet metal that protects a vulnerable joint and directs water away from the area. Flashing is also used anywhere the decking is cut open for some type of penetration. For example, a chimney requires flashing all around it. The flashing prevents water from seeping through the seam where the chimney walls meet the roof. Other roof penetrations such as vents and skylights also require flashing and may come with flashing as part of the finished product. Another common place to put flashing is around dormers where the vertical walls of the dormer meet the pitched roof. Similar to a valley, this area can collect a lot of water and requires extra protection. The final outermost layer of the roof is the shingles. It is the part of the roof that is most visible. Many of our blog posts have discussed the wide variety of roofing materials in use for residential roofing. However, the most common type of residential roofing has not changed in over a half-century. Asphalt roofing remains king of residential roofing. However, the passage of time has seen many adjustments and improvements to asphalt shingle roofing. Some innovations were minor changes that made asphalt shingle more durable. Others were major innovations, such as the introduction of architectural shingles. The most common type of asphalt shingle is called three-tab shingle. The shingles are made of strips about three feet long. Each strip has two slits perpendicular to its length to create the appearance of three shingles. Three tab shingle is almost completely flat and has a regular repeating pattern. It is available in many colors and with a wide variety of special features. Typically, three-tab shingles are installed with nails but have special adhesive on the back that is activated by heat from the sun. The adhesive creates a tight bond between the layers of shingle and increases wind and water resistance. For areas that experience high winds, premium asphalt shingles are available that have added adhesive to sustain extreme wind conditions. Architectural asphalt shingle is a relative newcomer. Unlike three-tab shingle, it is layered to create three-dimensional shingles that mimic the shape and appearance of more natural materials. The shingles are irregularly shaped, further contributing to its natural appearance. Many new luxury homes use architectural shingle. Some homeowners who install new roofs are also opting for architectural shingle. In addition to its appearance, architectural shingle may also increase the value of a home when it comes time to sell. If you’re in the market for a new roof, you’ve likely come across these two popular types: asphalt shingles and metal. Which one is the better option for you? Below, we weigh the pros and cons of the two types of roofs to give you a great starting point in your search. Metal is the clear winner here! The typical lifespan for a metal roof is 40-50 years. Some metals, like zinc and copper, can last 100 years or more! Typical asphalt shingle roofs, on the other hand, only last 20–30 years at most. Metal roofs can last for many decades without showing signs of wear. They’re also highly resistant to extreme weather, including hail, wind-driven rain, snow and ice. They can withstand winds up to 120 mph due to the interlocking pattern of the panels. Shingles will more easily blow off of a roof, leaving spots vulnerable to moisture penetration. That said, they are many higher quality, heavy asphalt shingles that can carry a high wind rating. The cost of a shingle roof can be much less up front than a metal roof. Long term, however, a metal roof pulls ahead and could save you a lot of money. You could end up having to replace your shingle roof three times over the lifespan of a single metal roof. Metal is also more durable (requiring fewer repairs) and lower maintenance. If you live in a dry region that’s prone to wildfires, you’d be better off with a metal roof. However, many asphalt shingles carry a Class A Fire Rating. If your metal roof is installed properly, it should require virtually no maintenance. Simply check your roof and gutters for debris a couple times a year. Asphalt roofs require regular seasonal inspections, repairs, maintenance and sometimes shingle replacement. Shingles are easier to repair than metal panels. A roofer can replace a single or fix an area with relative ease. Fixing a problem spot or replacing a panel in a metal roof is more difficult due to the way it’s installed and how the panels are connected. You will have a large variety of color, style, and design options for both metal and shingle roofs. Because a shingle roof requires less labor to install than a metal roof, roofing contractors can typically install them more quickly. Metal roof installation is more complicated and requires special skills. Shingles are heavier than metal, which can place more stress on your building’s structure. Metal is lightweight, so it can help preserve your building’s integrity over time. Rainshield Roofing & Construction installs both shingle and metal roofs. If you’re interested in metal, we recommend considering Snap-Loc Metal. If you’re leaning more towards shingles, consider the more durable Certainteed architectural shingles, which can last much longer than traditional 3-Tab shingles.